After treating this aluminum fender one year ago, the OxiX side still looks like the day we applied it. The untreated side has oxidized and the broken light has marred the aluminum fender from swaying during transport. OxiX is also perfect for protecting surfaces from rubbing objects. 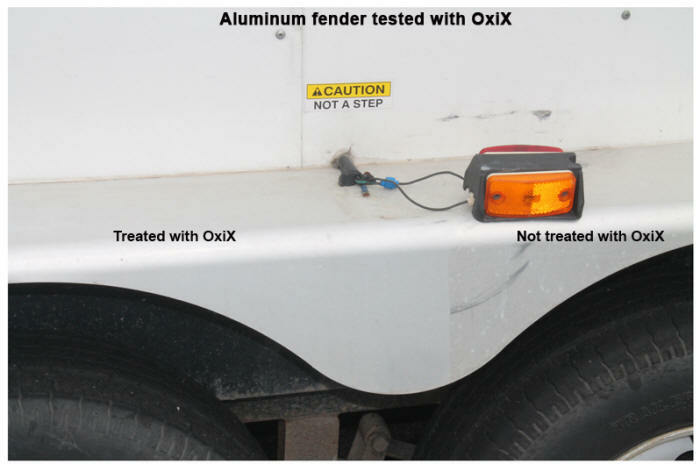 We used OxiX on our old aluminum horse trailer floor. Talk about easy to install just rolled it on with a paint roller let it dry and put on a second coat. Dries crystal clear and looks great! We're not any paint experts either. We are extremely happy with this product it saved us over $900 from doing the leading bed liner or equivalent and I think it did a better job! Every time I see a bed liner on a trailer floor, I have to wonder what they are covering up and how much urine and manure gets under it once it starts to crack. Thanks again to Greg and Oxix for helping us out! One happy customer! We were continuously having to paint the metal hand rails at our university buildings due to rust and corrosion. In an effort to eliminate the frequent applications of paint, we thought grinding all the paint away and sealing with a clear sealer could be the answer to our problem. After researching all of our large paint suppliers, no one had a product that was a clear sealer and would stop the rust, until we found OxiX. The OxiX has been on the hand rails for over 2 years with no visible signs of corrosion what so ever. Oxix has saved us money on initial cost and has outperformed any other paints that we have ever used. We have used OxiX as both a stand alone sealer and as a primer that we have painted over with great success. After these results we have started using the OxiX around the university for other applications with great success including the steam pipes in our boiler rooms and the light poles in our parking lots. OxiX is laboratory proven to protect steel, iron, aluminum, paint and more under the most severe circumstances. 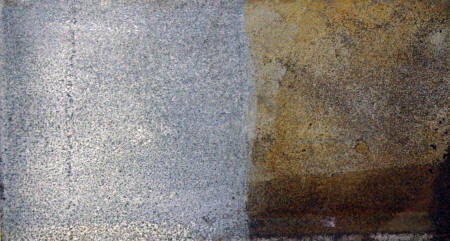 To the right is a steel coupon hand-treated with one coat of OxiX on one side. The entire part was then subjected to an application of hydrochloric acid, which accelerates corrosion on metals. The side treated with OxiX shows complete protection. These pontoons were sealed with three coats of OxiX. After 8 weeks sitting in the water in a boat slip on Texoma lake, we pulled the boat to see the results. The pontoons look just like the day we applied the OxiX. There is no oxidation, discoloring, and even the small water line easily wiped away with just a wet rag and no chemicals.